Occupational stress is the particular relationship between the person and the environment, appraised by the individual as taxing, exceeding his/her resources or sources, and endangering his/her wellbeing. It is not only the characteristics of the environmental factors, but also the perception of the person about the demands of the environment, his/her coping resources, his/her sources, and type of social support. The area where the study has been carried out is known for its heavy passenger and freight traffic and is the source of highest income over Indian Railways. This project concerns the problems which touch the railway sector globally. The actual evolutionary processes (swift changes in the field of technology, customers' demand, management, increasing economical requirements, pressure of the public opinion, growing competition, etc) contributing to the development of stable and recurrent stress of the train drivers who have the responsibility of carrying thousands of life to their destinations. This excess of stress and its consequences cost very high to the organization. The study has been carried out on the background of increasing work load and management push due to growing competition, increasing traffic and increasing pressure of opinion from the media and public with obvious reason for development of stress. 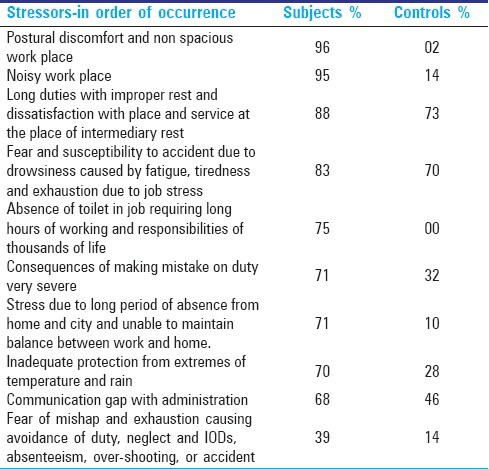 To identify job-related stressors in the Railways in relation to the work environment of Railway Engine Pilots as well as to assess level of stress among them. To identify one to one relationship of occupational stress with absenteeism, fatigue, symptoms of stress, familial discord, and biological functions. Help Railways detect, analyse, anticipate, and modify the influencing factors. 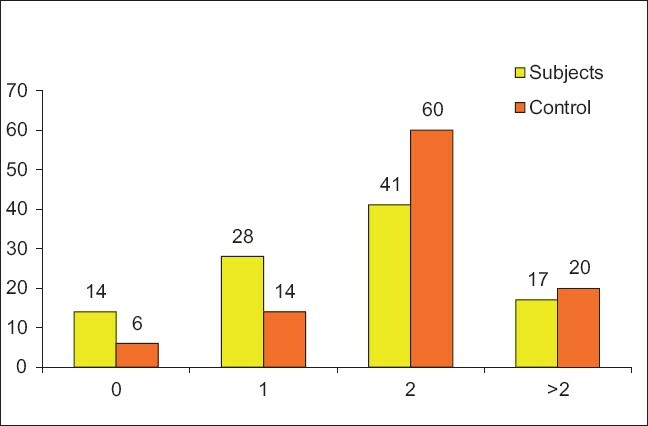 The study sample consisted of 100 healthy train drivers and 100 controls who have similar safety category but sedentary job attending the periodical medical examination on Tuesdays and Fridays with no illness as per the ICD-10 criteria, referred from the department during the period between 20/09/10 and 20/11/10. Subjects up to 50 years of age with no clinical diagnosis as per ICD-10 diagnostic criteria, referred from the department during the period between 20/09/10 and 30/10/10 were included in the study. Subjects included were not on any medicines. Subjects coming for PME on Tuesday and Friday were only included in the study. Subjects consenting to participate were included in the study. Subjects of SEC Railway, Bilaspur division were only included in the study. 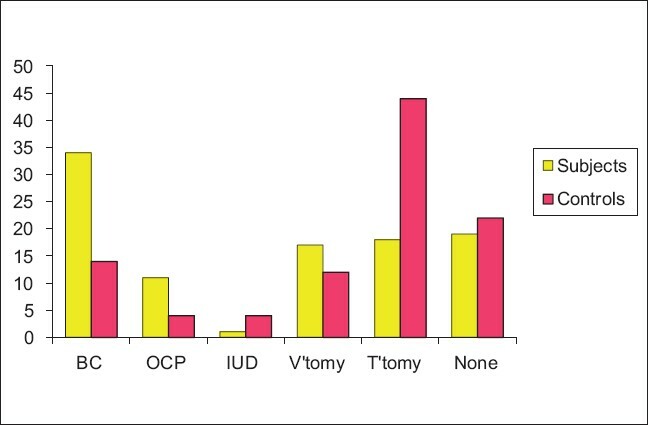 Subjects with any evidence of organic basis of any pathology through history, clinical examination, or laboratory reports were excluded from the study. Subjects with significant physical illness and above 50 years were excluded from the study. Subjects with any psychiatric disorder as per assessment scale - Brief psychiatric rating scale (BPRS) - were excluded from the study. Subjects not giving consent to participate in the study were excluded from the study. Subjects attending PME on days other than Tuesday and Friday were excluded from the study. Subjects consisted of Railway Pilots concerned with controlling of train and control consisted of station managers and station superintendents. Both the subjects and controls in the study were safety category staff requiring similar mental agility and decision-making skills sharing the same set of traffic information though the latter control multiple traffic information at a time. 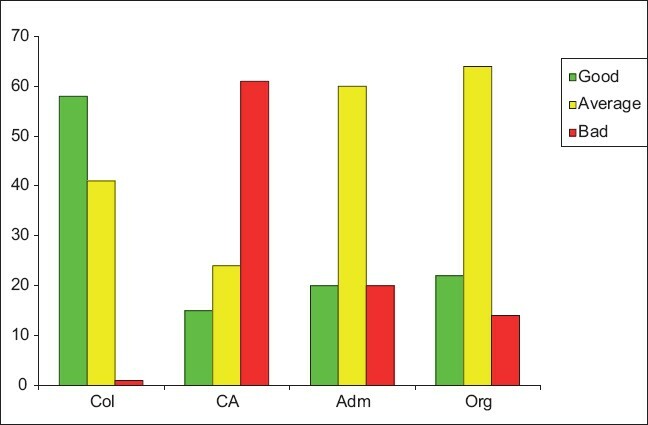 Subjects and controls satisfying the inclusion and exclusion criteria were included in the study and were subjected to live interview lasting about 20 min with specially designed questionnaire, Job Stress Rating Scale (JSRS) and Physical effect of stress (PESS) scale, and Brief Psychiatric rating scale (BPRS). Inter-rater and intra-rater reliability were good. Stress Reducers Rating Scale (SRRS) for rating the management regarding what is done by the management to reduce stress of its employees. BPRS is a clinical interview for assessment of psychiatric symptom and severity. It contains 18 items and rating is done on 7-point severity scale (from 0 to 6). JSRS consists of 12 items and is divided into three subscales, i.e. demand, control, and support. It is 1-point rating scale with a maximum score of 12. PESS consists of 14 items and has three subscales, i.e. physical symptoms pertaining to immune system, nutrition, and physical activities. It is 4-point rating scale with a maximum score of 42. SRRS consists of 20 items. It is rating scale with 5 points for each yes answer with maximum score of 100. Sr. DEE (OP)/SECR/BSP, Sr. DME/SECR/BSP, and Sr. DOM/SECR/BSP were interviewed on behalf of the management for rating the SRSS. Data generated in this study were subjected to analysis using computerized SPSS version so as to identify any significant stressor and one to one correlation with factors like absenteeism, fatigue, psychological and physical problems, marital or familial discord and biological functions. 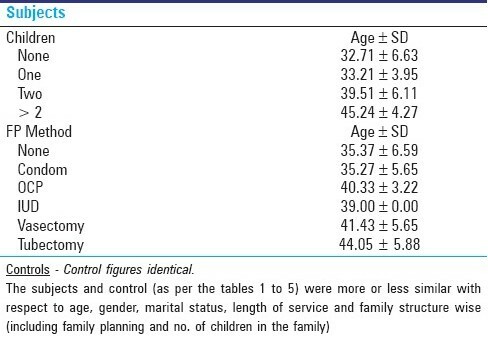 Demographic profiles subject versus control [Table 1], [Table 2], [Table 3], [Table 4], [Table 5], [Table 6], [Table 7], [Table 8], [Table 9], [Table 10], [Table 11], [Table 12], [Table 13] and [Figure 1], [Figure 2], [Figure 3], [Figure 4] and [Figure 5]. Among the top ten stressors identified, the top three were postural discomfort and lack of adequate space, noisy workplace, and long duties and improper rest. The most common symptoms of stress identified include disrupted sexual functions, muscle ache and pains, sleep disturbances, headache, stomach problems, irritability and anger, and frustration and anxiety. Significant negative correlation has been found with familial discord and absenteeism. Disrupted sexual functions have been identified resulting due to long duties and improper rest and inability to meet with household demands leading to familial discord. The study has identified that working with discomfort and fatigue without proper sitting facility, make the pilots in-alert, inattentive more drowsy, and susceptible to falling asleep: safety at stake. It is also identified that working in a recently introduced comfortable AC cabs (ongoing pilot project) doesn't cause fatigue even after long hours of duty rather it keeps them fresh and are able to keep alert, attentive, and least likely to get drowsy: resultant: more safe working. In many railways today, there are fewer people doing the same amount of work due to increased number of trains and trips owing to increased loading targets. The implications of which is managing the work by the same group of employees who often have increased stress, out of fear of layoffs due to being overworked. Solution : To combat the increased work load and take care of mental and physical health of the railway pilots, the cadre strength of the railway pilots concerned with safety of thousands of lives needs to be increased adequately so as to take care of long duty and improper rest, disrupted sexual habits, and safety at large. Ergonomics of the Cab with respect to discomfort due to insufficient cab space, seat discomfort, environmental stressors, and absence of toilet in job of long duties and safety of thousands of life, has been identified as most stressing in this study. Solution : As these factors are beyond own control, the employee needs to be thought ways to combat and ventilate stress. Management on the other hand should take steps to improve work condition - like designing of cabs to be comfortable, spacious with proper seats, air-conditioned to protect from environmental stressors, and with facility of a toilet within the cab. Solution : Management seriously needs to have periodical counselling sessions and programmes to teach relaxation and de-stressing. It is recommended that a clinical psychologist be recruited at all Zonal and Divisional hospitals of Railways for the purpose. Stress can manifest itself in a decline in performance of an employee which may trigger an employer's discipline policy. It can aggravate existing health problems or create behavioural health issues. Sick time and leave issues may prop up. The study has identified lack of recreational activities at the place of intermediary rest and that administration expects arrangement for sleeping and meditation enough for de-stressing of employees. Solution : During the course of data collection and interaction with the subjects, it has been found that recreation is perceived as best de-stressor by both subjects and control and the following was desired by the employees under study: "a recreation room with TVs, Magazines, carom boards, and Table tennis boards" - same is recommended. What is being done by railways? Problem has been identified by the Railways and recruitment process is in progress. 500 new recruits added in year 2010 and 600 new recruitment to be done in 2011. Still not enough as traffic and target has increased 5-folds in past 20 years and concerned employees have been added to 3.5-folds only. As a pilot project by the Indian Railways, five to six new engines have been introduced in almost all divisions which are spacious, with comfortable seats, and air conditioned. But most of the divisions have removed the ACs and replaced it with coolers - may be due to problem faced in exchange of signals. Need for a toilet within the cab is identified but no solution has been found yet. Worth mentionable is electronic signal exchange as used in most railways especially in Europe in high speed trains could be tried where the both sides of engine have couple of lights one each under control of driver as well as his assistant so that both the lights don't fail, which are lit for signal exchange at stations. Nothing is done for employees' de-stressing. Employees are recognized, appreciated, and rewarded for good work done. The place of intermediary rest is being renovated at almost every place. Has been made centrally air cooled at few places in S.E.C. Railway and is planned for at other places. News papers and meditation room is provided, but there is no recreational facilities. The high demand, low control over work, and low support at work with difficult work environment and inadequate recreation at the place of intermediary rest corroborates with development of stress affecting the normal biological functioning leading to either avoidance of duties or making railway pilots susceptible to fatigue and drowsiness, neglect, injuries, and accidents. Inadequate efforts by the management to reduce the stress of its employees are evident in the study. Urgency to have clinical psychologist is brought to fore. It is a privilege and a great pleasure to express our gratitude to our esteemed DG(RHS) Dr. V.K. Ramteke, Dr. S.K. Agrawal- CMD (S.E.C. Rly / BSP), and Dr. R.K. Jain-Director (H&FW/RB) who provided us with all the impetus needed for the study and for their guidance, support and inspiration from initiation to the compilation of the study. The research team is really thankful to them for taking their precious time out for the cause. We also thank Principal Training Institute, Uslapur, Sr. DME/BSP, Sr. DOM/BSP, and Sr. DEE (OP)/BSP for their kind co-operation during the course of the study. We would like to thank all who assisted in the study. Last but never the least thank all Loco pilots, Asst. Loco Pilots, Station Superintendents, Dy, Station Superintendents, Station managers and Asst. Station Managers consenting to and participating in the study without whom the study would not have been possible. 1. Taylor HL, Jacobs DR, Schucker B, Knudsen J, et al. Laboratory of Physiological Hygiene, School of Public Health, University of Minnesota, Minneapolis, Minnesota, USA, Journal of chr. Ds. Available from: http://www.sciencedirect.com/science [Last cited on 2011 Mar 03]. 2. Korasek R. Stress at work: A training workbook for working people by the institute of labour and the community. 1999. p. 113-5. 3. Overall J, Gorham D. Brief psychiatric (seven point) rating scale. Psychol Rep 1962;10:799-812. 4. 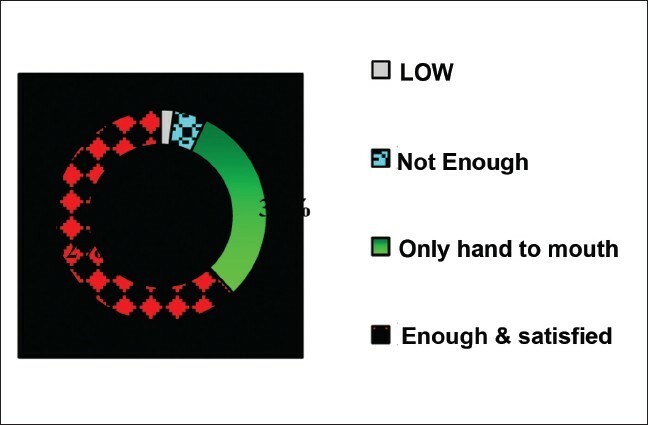 Available from: http://www.hillsorient.com/articles/2005/08/202.html - Top ten stressor [Last cited on 2011 Mar 03]. 5. Dorrian J, Roach GD, Fletcher A. Drew Dawson-Science direct- Applied Ergonomics: Simulated train driving: Fatigue, self awareness and cognitive disengagement. Available from: http://www.sciencedirect.com. [Last cited on 2011 Mar 03]. 6. Akerstedt T, Fredlund P, Gillberg M, Jansson B. Work load and work hours in relation to disturbed sleep and fatigue in a large representative sample. J Psychosom Res 2002;53:585-8. 7. Conditions of Work and Employment Programme (TRAVAIL). Available from: http://www.ilo.org/travail/lang--en/index.htm. [Last cited on 2011 Mar 03]. 8. Dollard MF, Winefield AH. A test of the demand-control/support model of work stress. J Occup Health Psychol 1998;3:243-64. 9. Prahastuti AD. 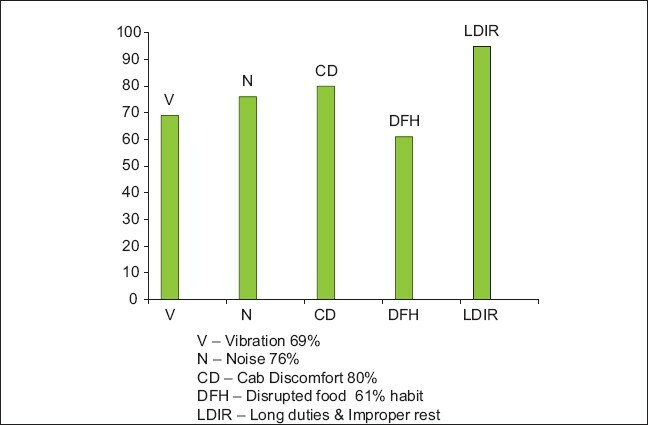 Sujoso, Relationship between work stress and vibration against fatigue and discomfort among train drivers at operation area VI of Yogyakart, 2010. Available from: http://eprints.undip.ac.id/19199/. [Last cited on 2011 Mar 03]. 10. Yahaya N, Yahaya A, Tamyes FA, Ismail J, Jaalam S. The Effect of Various Modes of Occupational Stress, Job Satisfaction, Intention to Leave and Absentism Companies Commission of Malaysia. Aust J Basic Appl Sci 2010;4:1676-84. 11. Hoyer J, Beesdo K, Gloster AT, Runge J, Höfler M, Becker ES. Worry exposure Vs applied relaxation in treatment of stress. Psychother Psychosom 2009;78:106-15. 12. Roemer L, Orsillo SM. Efficacy of an acceptance based behaviour therapy for GAD, evaluation in randomized controlled trial. J Consult Clin Psychol 2008;76:1083-9. 13. Covin R, Quimet AJ, Seeds PM, Dozois DJ. A meta-analysis of CBT for pathological worry among stressed. J Anxit Disord 2008;22:108-16.